As I was growing up, I remember watching the original "Annie" a couple of times. The film was 1982 was neat as I watched it growing up. But it wasn't something that particularly blew me away. Even as a young boy, it wasn't my most favorite thing to watch as a kid. Sure, the songs were catchy and the idea of an orphan finding a family and a home of their own resonated well with me, it just wasn't my favorite. I understand how powerful it is as a musical, and as a popular culture piece on whole. While I understand the tendency to recreate the big, popular culture pieces. I just really don't see a point in remaking "Annie." In this new updated version, Quvenzhane Wallis plays Annie. Wallis is an actress I pretty much fell in love with when I saw her in "Beasts of The Southern Wild," I thought for sure that she was going to be the next big child star. But I also thought she would be a child star who wasn't afraid to make the edgy choices, and that excited me. Jamie Foxx plays Will Stacks, the rich guy who takes Annie under his wing in order to fall into father figure mode. Cameron Diaz plays Miss Hannigan, the cruel foster care provider who is Annie's caregiver. Both Rose Byrne, David Zayas and Bobby Cannavale fill out the rest of the supporting cast. That is a pretty stellar cast for any movie, but this cast is completely wasted and completely wrong for a new rendition of "Annie." 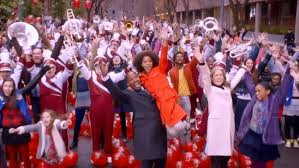 The first big problem I see in "Annie" is that, even though "Annie" has always been a musical, this film is absolutely wrongheaded as a musical. It seems director Will Gluck had no interest in dance choreography, singing, dancing, or basically any movement at all. The musical numbers are the most awkward to watch over this film's hour and forty-five minute runtime. It seems everything about the musical numbers where an afterthought in this movie, because they feel like an afterthought over the entire film. Quvenzhane Wallis maybe a great, young actress, but she really can't sing. I hate to bad-mouth such a young actress, I really do. But, there is something very off about her singing, and they run all her musical numbers into the ground. As for Jamie Foxx, Cameron Diaz, Rose Byrne and Bobby Cannavale? Well, they spend the whole movie overacting. There is an overdone quality to each of their performances, and it is hard to not snicker each time one of them comes onscreen. That is the biggest disappoint for me overall. Foxx, Diaz, Byrne and Cannavale are all actors I love a lot, all actors I respect with the utmost sincerity. But watching them overact just comes off phony to me. Cameron Diaz is trying way to hard to be despicable, and it just doesn't work. Jamie Foxx and Rose Byrne feel completely pedestrian in their roles, and Cannavale is flat overall. It really just gets sad to watch after awhile. I feel if musicals are going to work as films, the acting and singing needs to be paramount. The best musical-films, like "Moulin Rouge!" or "Paint Your Wagon," or "Les Miserables" only work because they nail their singing and acting perfect, and the cast makes sure we feel every emotional beat each character makes. I just didn't get that from "Annie." If you are going to make a musical, the musical aspect of the movie needs to matter. Its pretty clear to me that it didn't matter to Gluck and that is too bad.